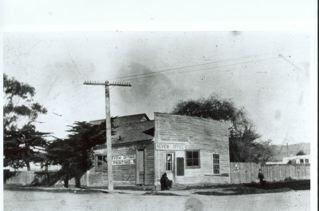 Photo: The old HMB Review office. Is that a power pole in front? …In the late summer of 1925 the Half Moon Bay Review devoted plenty of space to the race between Great Western and Pacific Gas & Electric Co.– the two power companies engaged in, well, a power struggle, to see who could electrify Pescadero and San Gregorio first. Beginning the work of planting poles in different parts of San Mateo County, Great Western was declared the winner, having lit the first light in Pescadero 24 hours before PG&E…. For decades there had been a subtle competion between Half Moon Bay (the “metropolis”) and Pescadero (the little village). There were some in Half Moon Bay who looked down on the Pescaderans–who were roundly criticized in the paper for not painting the fence around the old cemetery. In my opinion, Half Moon Bay could act a bit snooty when it came to their neighbors on the South Coast. In 1925 the Half Moon Bay Review’s editor wrote: “Scarcely had the electric current reached their town, the inhabitants started a movement to have a street lighting system. Pescadero is without doubt populated with boosters, who never overlook an opportunity to advance the welfare and profess of their city. “Only a short time back, they saw a bank and post office building erected on their mainn street, just at present a new high school is in course of construction. Barely able to contain their curiosity about how Pescadero looked under electric lights, a headline in the Review read: “Pescadero. We’re Coming”. The excuse was a meeting of the Coastside Civic Union to be held in Pescadero.